The delegates issued 26 decrees. Most of these decrees fell into five categories (Our Mission, Aspects of Jesuit Life for Mission, In the Church, Dimensions and Particular Sectors of Our Mission, and Organization and Governance). The delegates also approved an introductory and a concluding decree. The wordcloud below represents the most used words in the decrees, with a larger size denoting greater frequency. All the decrees are available the interactive chart below. Search the titles or categories or filter the display based on the same categories. Also available below are an allocution delivered by Pope John Paul II and a series of remarks by Kolvenbach. The full contents of all these documents, as well as the other Essential Documents, are searchable available through the Portal. They can each be browsed and downloaded individually. 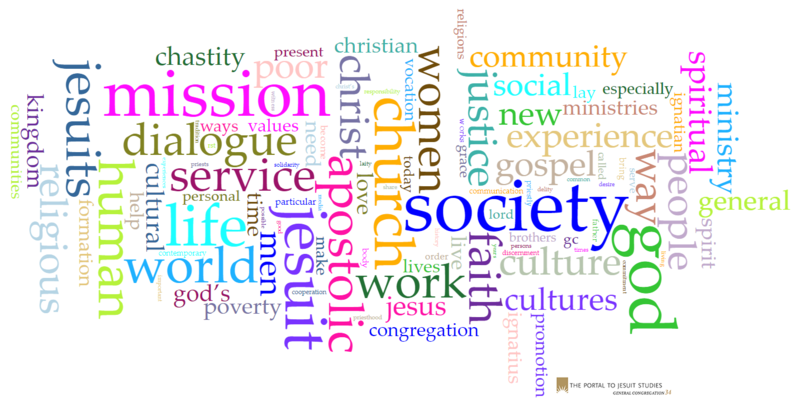 For more on the 34th General Congregation of the Society of Jesus—especially on the important historical context for the gathering—please consult Jesuit Life & Mission Today: The Decrees & Accompanying Documents of the 31st–35th General Congregations of the Society of Jesus, ed. John W. Padberg (St. Louis, Mo. : Institute of Jesuit Sources, 2009).